Heise, a German IT news portal, reported today about a chip presented to the State Council, including Erich Honecker, exactly thirty years ago. After the developers had ground away the surface of the chip for analysis, Nendel recalls, Cyrillic letters appeared: "When will you finally stop copying us?" Other than the above source I did not come up with any evidence that corroborates that story. The story allegedly came from Karl Nendel (German Wikipedia), referred to as Nendel in the above quote. While the story is credible in general, it seems odd that a for-profit company like Intel would include such a message on a chip when it incurs extra cost and possibly production steps and out of millions of chips only very few would find their way to the alleged/intended recipients. Is it true that Intel engineers included a message to engineers from the Eastern Bloc in Cyrillic? Preferably I'd like a source other than Karl Nendel to confirm the story, such as Intel engineers or similar. Note: it's not clear from the story if the message was also written in Russian or whether it was merely a message in another language but transliterated to Cyrillic letters for effect. 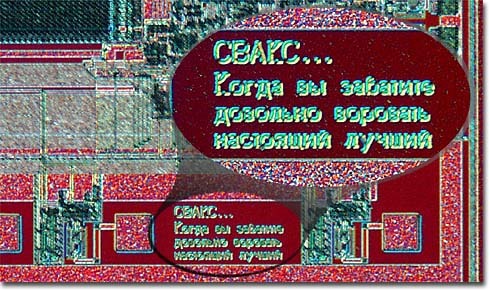 "VAX - when you care enough to steal the very best " Apparently this quotation was gleaned from a sign on a purloined VAX 780 used by the Soviet military and was intended to send a special message to Russian chip designers determined to reverse engineer Digital's designs. In the mid-1980s, a discovery in a laboratory of the Kombinat Mikroelektronik Erfurt at the Ministry of State Security of the GDR (MfS) struck like a bomb. A short message was found on a microprocessor of the American company Digital Corporation when the chip was analyzed. The writing was on the metallization level, which serves to connect the individual components in an integrated circuit. Since this level is not at the top, the text could only be found by those who removed the circuit layer by layer in order to understand the manufacturing technology. In a very bumpy Russian, the end of technology espionage was demanded there: "When will you stop stealing!" This discovery showed them that it was known in the West that Eastern secret services procured armaments and high-tech products from the class enemy in order to analyze and rebuild them. Quoted from: Gerhard Barkleit: "Mikroelektronik in der DDR. SED, Staatsapparat und Staatssicherheit im Wettstreit der Systeme", Berichte und Studien Nr. 29, Hannah Arendt Institut für Totalitarismusforschung, Dresden, 2000, p 33. Karl Nendel as the source for this message in a 80386 wrote about that in his book General der Mikroelektronik: Autobiographie. The inside surface of the right side cover has the Roadrunner logo and the developer's signatures molded in. 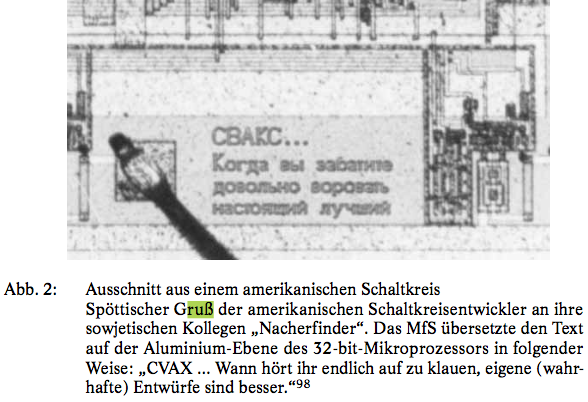 Since the copy of a VAX design did result in GDR 32-bit microchip that made it into production, the MME U80701, it may also quite well have been just a mixup of company names. That seems to lead to a slight misconception in the Heise article from the claim. Ein knappes Jahr später lief dann die Vorserienfertigung im VEB Kombinat Mikroelektronik Erfurt (KME) an. Zur Feier des Tages sollte Honecker den Speicherbaustein überreicht bekommen, hübsch eingefasst in einer blauen Glaspyramide. „Den Sozialismus in seinem Lauf hält weder Ochs noch Esel auf“, soll sich der damals gesundheitlich und politisch schon schwer angeschlagene Staatsratschef gefreut haben. Es war einer seiner letzten öffentlichen Auftritte. ( Bild: Bundesarchiv, Bild 183-1989-0313-123 / CC-BY-SA 3.0) Doch in Honeckers blauer Glaspyramide steckte gar kein funktionsfähiger U61000, sondern ein anderes Bauteil. Die Mitarbeiter des KME haben das Original lieber für sich behalten. „Wir dachten, dass es sowieso egal ist, was der da überreicht bekommt", erinnert sich einer der Beteiligten gegenüber der Mitteldeutschen Zeitung, „dann haben wir gelost, wer ihn mit nach Hause nimmt“. As you can see the festive pyramid clearly speaks of a micro-processor. The U61000 was not a processor but a 1Mbit RAM chip (a Megabitchip the GDR was pretty proud of). The U80601 on the other hand was based on a 80286 from Intel. Die Bedingungen dafür waren geschaffen, wenn auch nicht ganz aus eigener Kraft. Denn die Ingenieure im Osten fingen bei der Chipentwicklung nicht bei Null an. „Wir hatten sogenannte Fremdproduktanalysten", erinnert sich der Hüter des 32-Bit-Prozessors heute amüsiert, „die taten nichts anderes, als irgendwie aus dem Westen beschaffte Bauteile Mikrometer für Mikrometer auseinanderzunehmen". Anschließend wurde der Herstellungsprozess nachvollzogen. „Der Aufwand dabei entsprach einer Neuentwicklung." Und die ursprünglichen Designer der Schaltkreise schauten quasi aus der Ferne zu, lächelnd und sich ihres Vorsprungs gewiss: „Einmal", erzählt der DDR-Mikroelektroniker, „fanden die Kollegen auf einem Chip eine mikroskopisch kleine Inschrift". Viele Grüße aus Silicon Valley stand da. Auf russisch. __The conditions for this were created, albeit not entirely by their own efforts. Because the engineers in the East didn't start from scratch when it came to chip development. "We had so-called 'foreign products analysts'," recalls the keeper of the 32-bit processor, amused today, "who did nothing other than take apart micrometer by micrometer components procured somehow from the West. The manufacturing process was then traced. "The effort involved corresponded to a new development. __And the original designers of the circuits watched from a distance, smiling and certain of their lead: "Once," says the GDR microelectronics engineer, "their colleagues found a microscopically small inscription on a chip. There were 'many greetings from Silicon Valley'. In Russian. Apparently there was a 386-compatible successor to the system EC-1835 in the pipeline: the MP800 (based on an U80800), scheduled to be needed at around 1994 (according to plan). 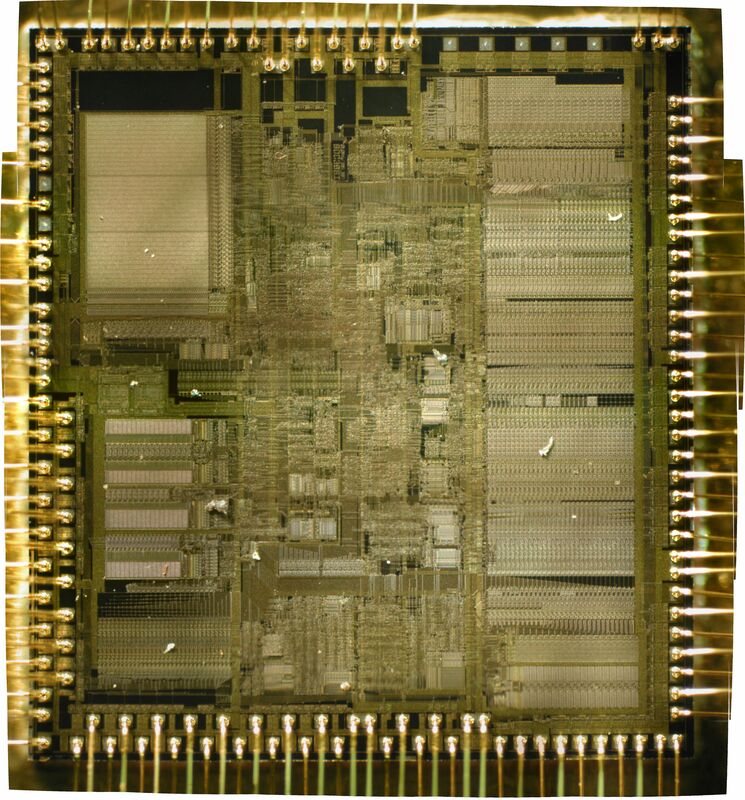 Via The home page of Marty Schultz showing a 4.65MB image (6180x6636) of an Intel A80386DX-20 IV // Visit that page for more examples of chip art. Another early example on Wikimedia. 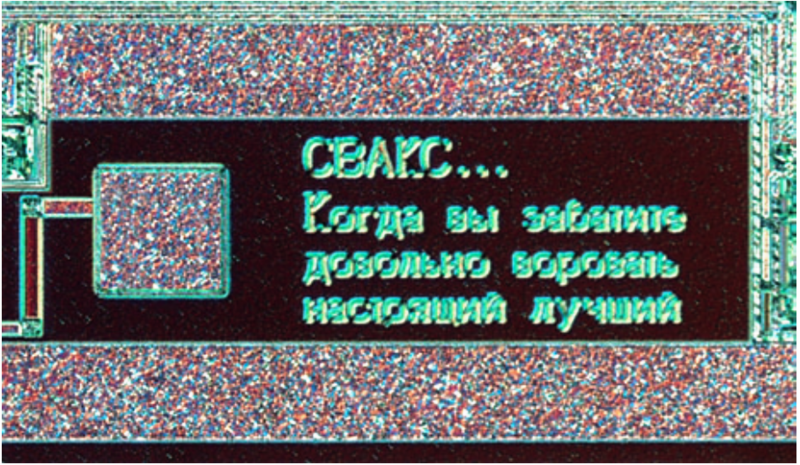 East-German engineers did find a message in Russian written in Cyrillic script while slowly grinding through the layers of a 32-bit chip they wanted to reverse engineer. For the VAX-chips this is a proven fact. For the 80386 Intel chips this is not a proven fact. The magazine article mixes up a lot of details and seems to invent through wrongful combination a few facts from looking them up on the wrong pages of a lexicon. Nendel as the source for the application of a fact about VAX chips to analysing a 386 maybe a better source than the article. But unless a picture of an Intel 80386 disassembled to reveal a message appears: it seems that Nendel got his story right for "a 32-bit chip" but then confabulated the Intel part of the story. the GDR didn't sand down and rebuild the 386 DX, but the 286. And also there no Cyrillic characters were found, but with the DEC Microvax CPUs, which were also sanded down and copied. Small details, but not unimportant, especially when journalists and media are accused of sloppiness and fake news. The Intel 286 was still manufactured in 1990 as in a few fully functional replica models. Also for the GDR scientists, functionaries and engineers the replica of the Intel 386 was not feasible!! That was already certain with the appearance of this CPU. The effort of the reproduction of the i286 CPU already exceeded the development expenses of Intel. The replica project i286 as well as further microelectronics had already overtaxed the GDR financially, the 386 would have ruined the GDR. Therefore the GDR engineers wanted a co-operation with the Soviet Union with the reproduction of the i386 – in complete misjudgment of the possibilities of the Soviet Union in the microelectronics range. The Soviet Union had re-developed the 8086 including coprocessor, the construction plans were available. At RAM, 256kbit was probably the end of the Soviet Union. 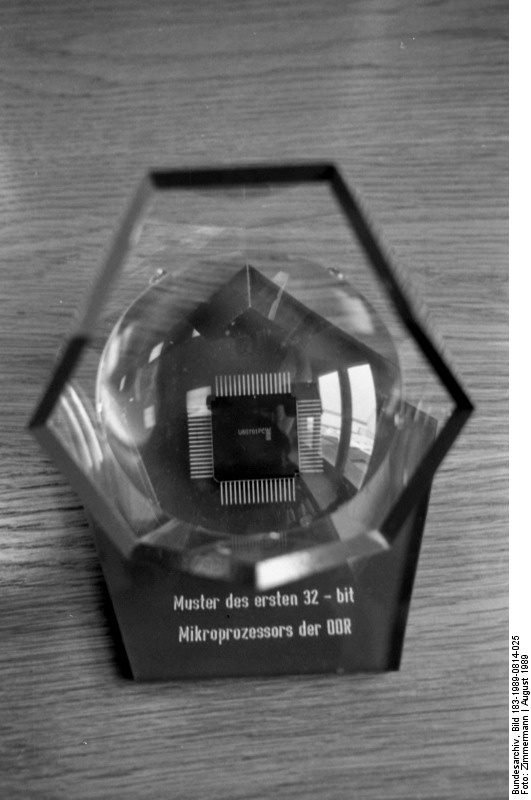 Ultimately remains that the GDR under enormous efforts a technological masterpiece: the replica of functioning piece of microelectronics with hundreds of thousands of transistors in the range of 1 nanometer. Along with the development of all the equipment to reveal these structures (grinding machines, nanometer scale photography). Perhaps it can be compared with North Korea's technological efforts in nuclear and rocket technology: An isolated poor country that produces high-tech in a few sub-areas. And for these few areas it accepts the poverty of millions of people. Fixing the most glaring errors in a piece of journalism is a good thing. Being transparent about it would be even better. Is there a text string that crashes iPhones? Do photovoltaic solar panels need replacement after 20 years? Are there certain sounds that cannot be heard through the phone? Is there such a thing as a “GPS ID card” or GPS tracking on an ID card? Was text messaging originally developed for deaf people?